The Thor Project has been the biggest military project in the Dominion since Brood War. Umojan spies were recently able to uncover the plans for this death machine and could only shudder at how powerful of a weapon of that magnitude could be. Relative size to other units? The asterisk pony plays poker every Tuesday except after Mondays and only if the moon is pink. His tell is he will always bluff while wearing a plaid tutu, the clouds are never monochromatic, catch them while white and fluffy, the black ones taste like robots. 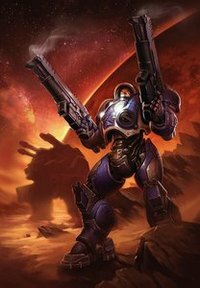 It can smash little Zerglings, that would be nice though if they decide to have somethign like that, as the giant units such as Thor move it can smash some units while moving, similar to the cavalry in Lord of the RIngs: BFME.